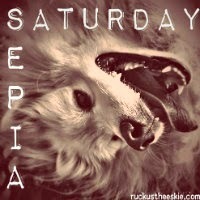 Ruckus the Eskie: Sepia Saturday #96: Blu-rays, Popcorn, and (Netflix and*) Chill? Sepia Saturday #96: Blu-rays, Popcorn, and (Netflix and*) Chill? Seems like a good plan for the weekend! *Netflix not pictured, but we'll definitely be watching (and chilling!). Go easy on the treats, my friend! Sounds like an awesome way to spend a Saturday night! In fact, we may be doing the very same thing! Happy SS!! Our peeps love the Netfliks too. Popcorn is on the grocery list cause they are out! Today is a mainly inside day for us, wet and cold out. No sepia pics though, this week our thoughts are with Sue and Jeffie. Sounds like a really good night! !